Kuzhi paniyaram (குழிப்பணியாரம்) is a popular Tamilian snack that is made in a special pan with hollow moulds. Coconut paniyaram (தேங்காய் பணியாரம்) is a variety of kuzhi paniyaram and it has the underlying gentle sweetness of coconut. Traditionally pans made of stoneware or cast iron were used make paniyaram. Batter is poured into the moulds and the paniyarams are turned with a stick to ensure uniform cooking. Nowadays non-stick paniyaram pans are available and less oil is needed to make paniyarams in these pans. Click here to view and know more about paniyaram pan. How to prepare the batter: Wash raw rice and urad dhal well; soak in 2 liters of water for 4-5 hours. Grind the ingredients in a wet grinder into a smooth, thick paste. Add salt and mix well. Allow the batter to stand overnight or at least eight hours. Next morning, mix the batter well. 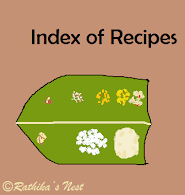 Grind coconut meat and green chilies into a fine paste using the mixer-grinder. Add the paste to the batter and mix very well. The batter should be of pouring consistency. Add in asafoetida and blend well. Now the batter is ready for making paniyarams (Fig.1). How to prepare coconut paniyaram: Mix the batter well before using. Heat the paniyaram pan on medium flame. Once heated, add few drops of cooking oil into each mould. Now add the batter into each of the moulds, just short of the brim (Fig.2). Once cooked, the edges of the paniyaram will separate from the mould. You will also see bubbles appearing on the surface. Now using the stick, turn the paniyarams over so that the uncooked side is in touch with the pan and gets cooked (Fig.3). Turn the paniyarams once or twice to ensure that they are well cooked and the surface is golden brown in colour. Remove the paniyarams from the mould, serve hot with any type of spicy chutney. Note: It is preferable to use up the batter at one go. However, you may refrigerate the leftover batter and use it to make paniyarams on the second day.